Top Ten Tuesday is an original feature/meme hosted by The Broke and the Bookish. I've never participated in a Top Ten Tuesday post before, but that's because I usually can't think of 10 things to list. This Tuesday's post was different. Everyone bookworm has bookish confessions - for me, it was just a matter of deciding which ones I wanted to share with you guys. 1. I love hard covers. So much so, that if I own the book in soft cover and come across the hard cover at a thrift store or in the bargain section of the book stores, I will buy the hard cover to replace the soft cover. 2. Before I purchase a hard cover, I always remove the dust jacket to look at the cover/spine just to see how visually pleasing it is or isn’t. But I never actually remove the dust jackets once I get them home. 3. I was 16 years old when I read Outlander by Diana Gabaldon. I loved the book and I fell in love with Jamie Fraser. Now, 10+ years later, I am married and my husband’s name is James Fraser. Crazy. 4. I always have a book with me, wherever I go. Even if I’m just going over to a friend’s house – you never know - they could get a really important phone call and I’d just be sitting there for 20 minutes wishing I had a book with me. 5. I look forward to waiting in the waiting room before appointments just so I can read my book. I also look forward to flying, just for the (mostly) uninterrupted reading time. 6. I have only read the first 3 Harry Potter Books. I was reading them as they were being released, but then I fell behind and the movies started coming out. I told myself I wanted to re-read the first HP book before the movie and that never happened. This is what I said before each movie. And now I tell anyone who will listen that I plan to have a huge Harry Potter reading/movie watching marathon in which I will read each book, followed by its movie. This hasn’t happened yet, but it’s on my bucket list! 7. I think it’s really weird when people don’t have any books in their home. I get it, you don’t read a lot, or you use the library, but everyone should own a few books, even if it’s just coffee table books! 8. It makes me sad that I will die before I can read ALL the books. When I was really young, I believed that I could read every book in the library and for a few months, I took out books starting on the top shelf of the ‘A's. 9. When my husband (boyfriend at the time) and I were moving from the East Coast of Canada, back to the West Coast, he made me lift up all my boxes of books and decide which boxes felt the heaviest. The top 10 heaviest boxes came in the truck with us because hubby didn't want to pay the movers to ship the books across the country for a second time. Seriously. I think we saved maybe 10 bucks. 10. If I’ve been to an author reading and hear them read out-loud parts of their book, I will then read the entire book in said author’s voice. So if they have a British accent, I will read the book with a British accent in my head. Tell me: What are your bookish confessions?! I totally agree with number seven. It makes me sad when I see someone's bookless house. I thought I could read all the books too, once. It's pretty cool, hey? :) Although, MY James Fraser doesn't think it's nearly as neat as I do lol. I totally understand your sadness about not being able to read all of the books you want to read. And more just keep coming out! I try not to think about it because it overwhelms me too much! I still love how you take off the dust jacket to see what the hardcover book looks like underneath. Now I'm going to be doing that ALL THE TIME! YOU MARRIED JAMIE FRASER???? How crazy! And, oh my gosh, MAJOR anxiety when I think about how many books are out there and how much time I have to read them. I mean, a book is published EVERY 30 SECONDS! That doesn't give me enough time at all! I'm glad I'm not the only one who thinks about this. I think about ALL the books, ALL the time! I must learn to stop wasting so much time and accept that it's ok to read for an hour+ everyday. Haha! That's funny about your Dad and the dented book - this is one of the reasons why I'm always nervous to order books online! What if they aren't in pristine condition once they're delivered?! I take the dust jackets off when I'm reading the book too! I loved Outlander (more than any others in the series) and it's awesome that you married James Fraser! I like arriving in the waiting room early too (if I have a good book). 1. I am opposite with you on hardcover. I hate hardback books. They're so heavy and cumbersome. The ones I have were either gifts or books that I just couldn't wait for the softcover to come out before reading. 7. There are people who have no books? None, at all? What? How? I agree some are heavy, and since I don't have an e-reader, it can be awkward to have a big hard cover in my purse at all times, lol, but I do prefer hard covers for when I'm reading in bed! It just stays propped up easier. 1. Books I consider "high-brow" are prominently displayed in my upstairs bookcases. 2. I buy all of Dean Koontz's new books in hardcover. I'm not sure I even LIKE Dean Koontz anymore. 4. I set up a little reading nook in my living room, but my favourite place to read is still my bed. 5. I was adamently opposed to buying a Kobo - until I got one. Now, I couldn't live without it. Once, the battery ran out while I was in the middle of a book, and I was distraught...until I remembered I own the book in paperback. It still wasn't the same. 6. I quit my book club partially because it made me mad that the conversations got ridiculously sidetracked and some of the women didn't even bother reading the books. 7. My favourite book is Self by Yann Martel - a fictional autobiography about a man who magically becomes a woman. The book has literally two chapters; how the heck do you know when it's time to put the book down and go to bed if there are no chapters to act as story breaks?! 8. I've listened to one audio book in my life - the last book in the Eragaon Interitance Cycle. I found it really hard to follow, and the voice acting made me laugh. 10. The book that made me fall in love with reading was the Stepsister by RL Stine. I always had my nose in a book when I was little, but it was that first RL Stine book (lent to me by my grade 4 teacher) that turned me into an addict. I never thanked my teacher for that. Jen, I love your list! And I love that you shared 10 with me! 6.I hear ya on the bookclub - mine is notorious for that! But I love the girls in it, so I've just accepted that most people rarely read the book and even when they do, the conversation about the book is short and sweet. 7. I haven't read Self yet, but two chapters?! I can't stop reading mid chapter!! 10. I loved Stepsister too! Actually, I loved a lot of RL Stine books when I was young. This meme is all over my reader today. If I get time, I'm gonna do it to! i love paperbacks. maybe we can swap. :) i do like hardcovers but i prefer paperbacks for practical reasons. and there are a lot of people coming out saying that they have never read harry potter. i kind of wish i could read it again for the first time. thanks for sharing! I like trade paperbacks, but I love hardcovers - although, I will admit, it can be awkward to carry around a hardcover in my purse all the time. And anytime I travel on a plane somewhere I try to plan what I will read so I'm not bringing a bunch of hardcovers with me. I like hard covers and paper backs. I confess I don't enjoy reading from kobo. I like to read in the bath tub which makes my books look very worn. I dog ear too which makes me a book bully, but old habits die hard. I agree on the book club thing. I dream of an oprah like book club where we get deep into the imagery and under lying thoughts of the author. But good people are great too. I would never complain about that. I too can't imagine a home without books. I have so many I need a room for them all. Books can be so beautiful. I can't imagine a gouse without them. Books ARE beautiful, aren't they!!? I love my bookshelves so much, and love to just look over at them during the day. 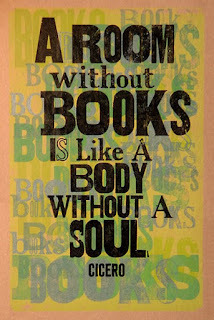 And I love using books to decorate - on coffee tables, end tables, window sills, etc. 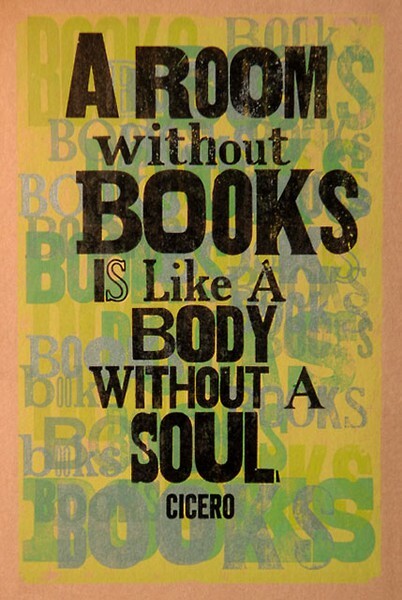 I could not imagine a home without books, either. As much as I "complain" about my bookclub, I really do love it and look forward to it every month! I LOVE hardcovers too!! And I love taking the jackets off because the title on the spine is always different, I just LOVE it. It's easier to read on airplanes.. reading at home.. my parents will just constantly interrupt me and I don't want to go out grumbling because they'd just complain about me grumbling. I can't believe you started taking books from the "A" section, haha. I wish I could read every single book... but that'd take a loooooooooooooong time. Yay!! So glad someone else LOVES hardcovers too! :) One day, I WILL take off all my dust jackets and display my books that way! While they are all on the books now, I do feel that over time, dust jackets can really date a book - like the first few books in the Outlander series I own in the original covers and the dust jackets look like really old romance books lol. 1. I always finish every book I start no matter how painful. 2. I only read 1 book at a time, very occassionally a "self-help" or non- fiction on the side but not often. 3. I love researching and shopping for books as much as I love reading them and I hate spending full price for a book. 4. I prefer the nice paperbacks to hardcovers (although I used to be opposite). I find the paperbacks are more easily portable when I take them with me. 5. I've never listened to an audio book. Unless I go blind I don't think I'd be interested. 6. I will NEVER read a book on a Kindle or a Nook. It can't be anything but a real book for me. 7. I will never read a book twice because there are so many books yet to read. Which brings me to #8 . . .
8. I too fret over all the books I'll never get to read. This year I lost my younger brother who also had passion for reading (real books also) and that worry makes it that much more of a reality. 9. I love the smell of books and when halfway through always take a deep inhaling sniff. 10. Finally, I leave you with one of my favorite quotes by John F. Kennedy, Jr. just after his mother Jacqueline Kennedy Onassis died. "My mother died surrounded by her friends and her family and her books, and the people and the things that she loved." Reading your list felt like reading an extension of mine! 1+2. I always finish the book too, no matter how long it takes me. If I read more than one book at a time, it can't be two fiction books, it has to be a non-fiction book on the side. The only exception to this is audiobooks (which I'm just getting into). I can have an audiobook on the go at the same time as another book. 3.Haha - I also research books before purchasing! I always compare online prices to in-store prices, I check Costco if convenient and if the time allows, I peruse second hand stores first. I rarely spend full price for a book either. 6. I don't own (and don't ever plan on it!) an e-reader. I'm happy that people are just reading, but I will never give up my books! 7+8. This is why I don't really get the whole re-reading thing. You're right, there are way too many books to be read. Their are only a few books that I'd like to re-read, ones that I read when I was really young and would like to revisit them (like Outlander!). I'm sorry to hear about your brother. I can't imagine ever losing one of my siblings.